Beach workout station. La Paz, Mexico. Several people have asked me to write a fitness-related article. Apparently, I appear “athletic” in some of my photos and some of you have wondered if it’s from all the bike touring. It’s not. No, the reason I’ve resisted writing about fitness is because I don’t want to send the message that you need to be an athlete to travel by bicycle, because you really don’t. 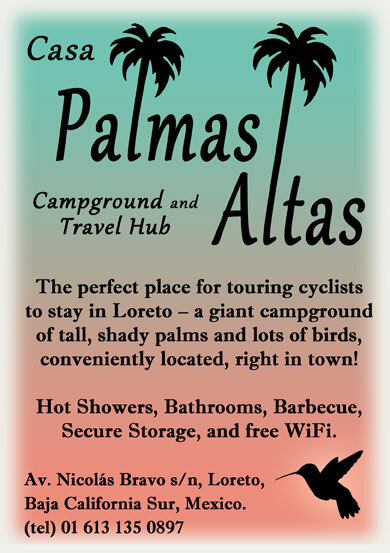 But fitness is a popular subject and the adventure-cycling angle hasn’t been explored yet, so perhaps it’s time. First off, yes, I do work out. I love physical exercise. Always have. I started training seriously in my early teens and I’ve kept it up for over thirty years. That’s why I look athletic in some photos. I am athletic. Also, I like to stay fit while I travel. 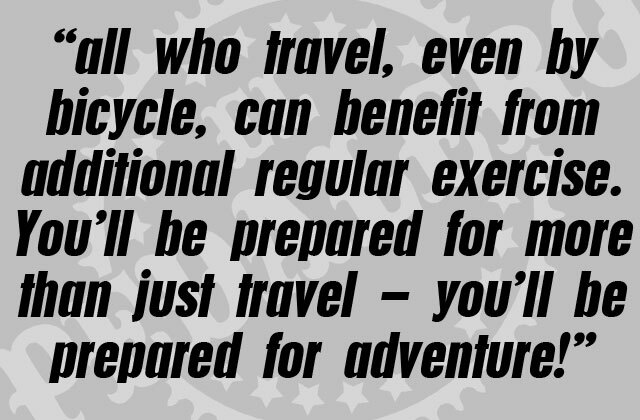 I believe that all who travel, even by bicycle, can benefit from additional regular exercise. I know, some of you are thinking, isn’t the cycling enough? It seems redundant, I agree. It’s like working out on top of working out. But hear me out. Having a more complete fitness (not only for cycling, but for anything physical) will enhance your travel experience enormously. You’ll be prepared for more than just travel – you’ll be prepared for adventure! And because you’re prepared for adventure you’re more likely to be adventuresome. And being adventuresome will lead to richer travel experiences. It’s a self-reinforcing process. I exercise most days I’m on the road. Sometimes, it’s a relaxed, maintenance-focussed workout. Occasionally, it’s an all-out assault on the body! I train using body-weight exercises and whatever is available (I almost never use gyms). I train for strength, muscular endurance, explosive power, flexibility, agility, and balance. You cannot develop these areas of fitness with cycling alone. You can develop a decent level of cardiovascular fitness, yes. But you’re missing out on the benefits of full-body fitness. 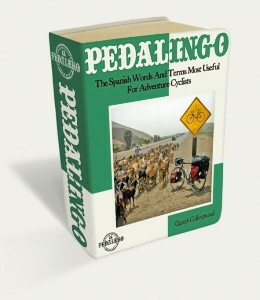 In the next section, I’ll break it down for you by explaining why being strong, agile, and so on is practical on a bike tour. I’ll suggest potential scenarios where each area of fitness would be useful. Then I’ll list some appropriate exercises. I don’t have space to explain how to perform each exercise, or to discuss the hundreds of possible variations, or to set up any programs. You’ll have to research that on your own. Practical purpose: Carry a loaded bike over a landslide or up stairs, so you don’t have to leave panniers unattended. Lift a loaded bike into the back of a truck. Exercises: Pull ups. Chin ups. Muscle ups. Push ups. 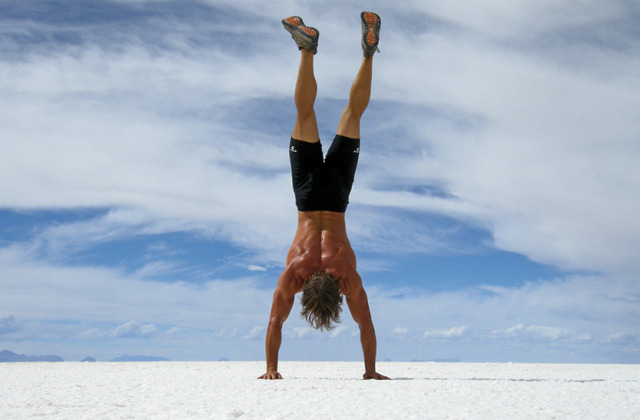 Handstand push ups (use a wall, tree, or cliff-face for balance). Curls, shrugs, presses, lateral raises (using panniers as dumbbells). Hindu squats. Pistol squats. Crawling movements improve muscular endurance and generally “toughen you up” for anything the road may throw your way. The “Dragon” Walk (pictured). Practical purpose: Push your bike up a steep road or dirt track. Swim to shore against a strong ocean or river current. Pump water or tires. Exercises: Jumping jacks. Jog and jab. Arm circles. Mountain climbers. Crawling movements such as bear crawls, leopard crawls, and dragon walks. Practical purpose: Jump over a river. Vertical jump to pick a mango, avocado, etc. Throw rocks at a pack of charging dogs (don’t laugh, this will happen to you at some point). Exercises: Plyometric movements such as burpees, jumping split lunges, and various plyometric push ups. Sprints (they don’t have to be running sprints – it’s just as effective to sprint while cycling or swimming). Practical purpose: Pick a sliver or bicho do pé out of your foot. Remove a hard-to-reach tick. Reach a ripe fruit or coconut. Exercises: Dynamic mobility exercises (active flexibility movements) are more effective and less damaging than static stretches. There are too many to mention, but here are some good ones: Shoulder shrugs, torso twists, side bends/reaches, deep squats, and lunges. Practical purpose: Ride over a narrow plank-bridge. Dodge potholes and gridlocked traffic. Stand squatting on the rim of a public toilet in order to avoid touching anything – yuck! Exercises: Leg swings (front-to-back and side-to-side), standing on one foot with arms extended to the sides. Side extended-arm planks. Head-stands. Frog-stands. If these are too easy, try them again with your eyes closed. When you radiate confidence, you attract good people and discourage bad people. Positive, trustworthy, open-minded people are attracted to self-assured individuals who stand up straight and walk with purpose. Negative, dishonest types avoid confident people. So do thieves. Travel, especially by bike, is far more enjoyable if you are less susceptible to illness and injury. Strong, supple bodies are less likely to suffer from the wear and tear of active travel. When you are physically fit your entire system is enhanced and you are less prone to colds and similar bugs. Looking soft and flabby during a period of poor diet in Brazil in my twenties (L). And looking fit and lean in Mexico in my forties (R). Guess which photo I prefer! Don’t pretend you haven’t thought about this! You know which photos of you are your favourites and it’s not the ones where you look fat. Don’t worry – it’s not narcissism. All healthy animals, from chimps to houseflies, take pride in their appearance. Vanity is a virtue. You’ve probably heard about endorphins, the pain-blocking neurotransmitters responsible for the euphoria you get during and after exercise. But you may not have heard about Brain-Derived Neurotrophic Factor. BDNF is a protein that protects you from physical stress (including exercise) by repairing damaged neurons and relieving anxiety. BDNF resets your brain. This is why we feel calm and clear-minded for several hours after working out. Of course, those who travel by bicycle are almost guaranteed this mental boost. 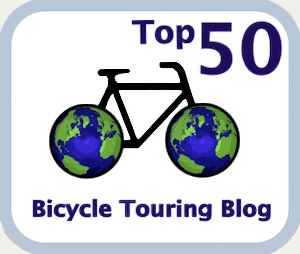 But, let’s face it, not every day of a bike tour is a day in the saddle. And even riding days can be slow-paced and brief. It’s fun to have a body! We all have bodies. It’s fun to have a body. Especially if it’s a healthy body. Fitness, as I’ve been discussing it here, is not the same as health. Health is the absence of disease. Fitness is something we build on top of health. It can be a part of health, but it’s not the only part. It’s not even the most important part. Sleep and nutrition – two areas I didn’t have space to cover in this article – are far more important. The main thing to remember is, fitness should be fun! Exercise can be very playful. Swim! Climb! Dance! Jump! Be foolish! Expand your definition of exercise. I’ve never liked the word, workout. Exercise should feel like play, not work. Maybe I’ll call it a playout from now on. OK, now stop reading and get out there. Use your body. Feature image (top of page): Another benefit of feeling fit is that it makes you feel more playful. Salar de Uyuni, Bolivia.